Natural and Artificial Flavors, Citric Acid, Sucralose, Acesulfame-K, Malic Acid, FD&C Yellow No. 5, FD&C Blue No. 1. Natural and Artificial Flavors, Citric Acid, Sucralose, Acesulfame-K, Malic Acid, FD&C Blue No. 1. LEGEND PRO is a powerful, pre-workout supplement designed specifically for those looking for an extreme energy boost to take their workouts beyond what they ever thought was possible. This pre-workout provides much more than just energy; it will have your mind dialed in to every rep of the workout with mind-bending clarity and focus along with sleeve-tearing pumps and road-map vascularity. 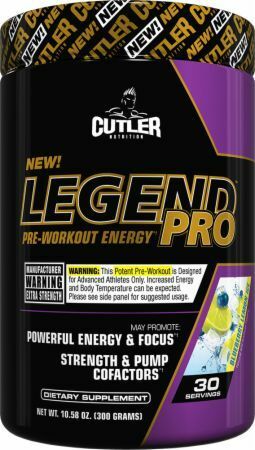 The Cutler Nutrition product development team worked with 4X Mr. Olympia, Jay Cutler, to create something that the market has never seen…the result was LEGEND PRO. This pre-workout formula contains an array of energy boosting ingredients that provide intense energy from start to finish. Pairing those with our blend of clinically-studied nootropics, cutting edge pump ingredients and our Lean Muscle and Training Matrix Blend, are what sets Legend Pro apart from the rest. Get ready to experience extreme pumps, tunnel-vision focus and long-lasting energy. Can you handle what the pros use?